Nursing ethics is often seen as taking a back seat to the more technical, psychomotor skills of nursing. When nurses do learn about ethics, it’s often in a context that teaches us to be kind angels that are there to heal the sins of the world. Indeed, new nurses tend to emerge from nursing school with the concepts of discipline and respect ringing in their ears. Too often, nurses aren’t taught the true nature of nursing. Instead, nurses graduate knowing to fear their managers, pour their sweat and tears into the systems in which they work, and never complain. The very call of the profession is to be a united, coordinated and strong voice of health. Because Canadian nurses are public servants, numerous, organized, and with a broad body of health knowledge, Canadian nurses are uniquely positioned to serve this role. The way Dr. Stephany puts it in her class, nurses should graduate nursing school ready to not only do their day-to-day job, but also to change the world. In a sense, to care enough for the patient, whether it’s a single person or an entire society, to live not only one’s vocational life, but one’s entire life in the path of service to others. Understanding nursing ethics from a perspective of the Ethic of Care is a strong asset in this regard. While nurses share the objective domains of health with the rest of the healthcare system, their unique ability to provide a firm bridge into the subjective domains is what makes nurses an indispensable component of any healthy society. “We do not live as isolated fragments, completely separate, but as parts of a great, dynamic, mutable whole.” Sharon Salzberg, author of Lovingkindness. The ethic of care is the moral imperative to act justly. 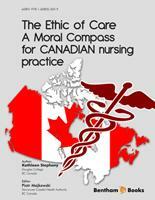 It has been almost thirty years since the ethic of care began to inform moral decision making in nursing. I chose to write about this topic because it is as valid for nursing today as it was at its inception. Nurses are still the ones who spend a great deal of time directly caring for others, not just by administering medications and treatments but also through touching, feeling, sensing and listening to what is said and what remains untold. In the writing of this textbook I have endeavoured to inspire nurses to be as compassionate and integral as they can be, so that they will leave every encounter with another human being, better than when they first arrived. As a nurse and psychologist, I have sought to bring a slightly different voice to the subject of the ethic of care, one that marries the richness of the wisdom from both professions. The intertwining of the two sources is evident throughout the pages of this book, and made real through the application of scholarly knowledge; the telling of compelling stories of lived experiences; and through the application of what is learned. A small editing note is needed. Throughout the writing of this textbook the term client is used more often than patient but both concepts are meant to interchangeably represent client and patient groups.